Sunday May 22nd 1898 I hurried through with the work this morning and we went up home to spend the day. The boys both went up with us. The Whetstone family were all invited down to Stevens. Spent a pleasant day with Mother. Monday May 23rd 1898 I did some sweeping and worked a little in the garden. It was a very warm day. I practiced a little Aunt Ellen and John Stevens were here in the evening. Tuesday May 24th 1898 I was busy with the work all day. It was warm and rained hard jist before supper time. I cleaned up the oil stove and did extra cleaning in the kitchen. 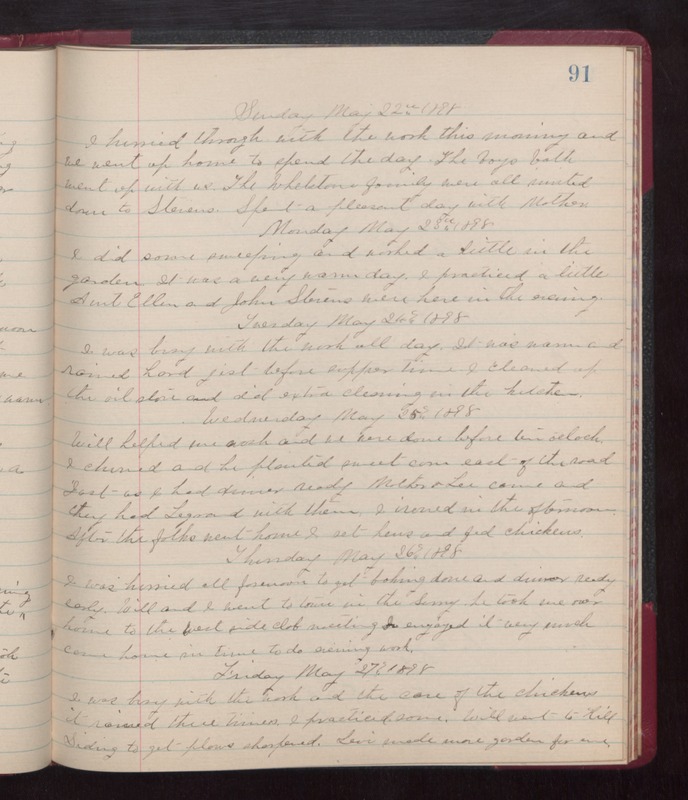 Wednesday May 25th 1898 Will helped me wash and we were done before ten oclock. I churned and he planted sweet corn east of the road. Jist as I had dinner ready Mother & Lee came and they had LeGrand with them. I ironed in the afternoon. After the folks went home I set hens and fed chickens. Thursday May 26th 1898 I was hurried all forenoon to get baking done and dinner ready early. Will and I went to town in the Surry. he took me over home to the west side club meeting. I enjoyed it very much. Came home in time to do evening work. Friday May 27th 1898 I was busy with the work and the care of the chickens. It rained three times. I practiced some. Will went to Hill Siding to get plows sharpened. Levi made more garden for me.